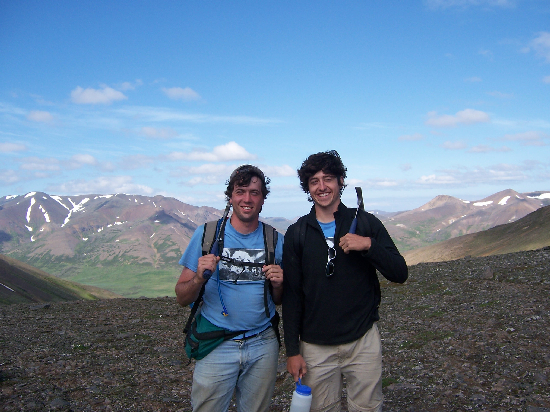 Over the past few days, Todd has been helping Yexary map a gabbro body in Skagastrond. They were highly productive and finished mapping today! Meanwhile, Adam, Rob, and Meagen are still on the wild rhyolite chase. Yesterday, we found rhyolite in a stream cut near Skagastrond, just where the map said it would be. 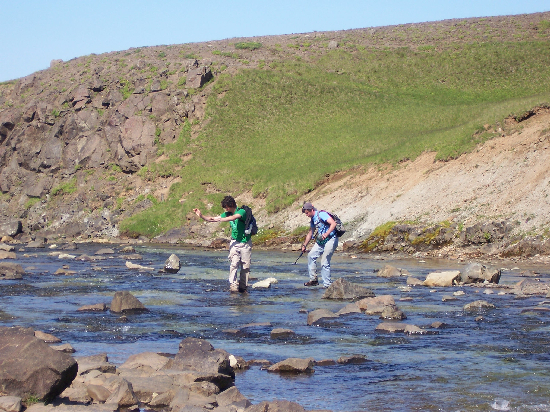 Adam and Rob getting their feet wet in a stream near Skagastrond that Meagen refused to cross. 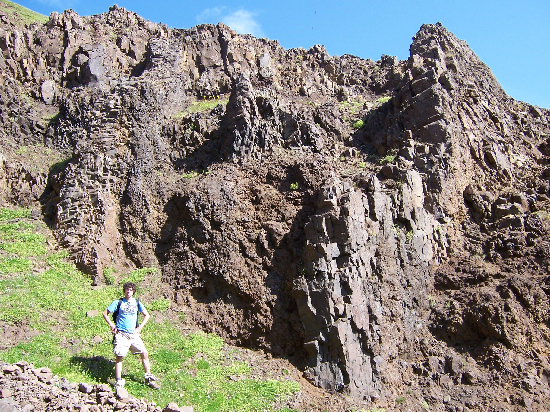 Today, we climbed Langadalsfjall in search for rhyolite that was mapped near the very top. On the way up, we found lots of dikes intruding the sheet flows. The exposures were so great that we couldn’t help but sample. Dikes intruding lavas - Adam for scale. We finally made it to the spot where the rhyolite should be only to find piles of rhyolite talus, grassy meadows, and white tuff. Despite our disappointment, we sampled the talus and enjoyed the awesome view. Rob and Adam at the top of Langadalsfjall. Unfortunately, we have a casualty to report. Rob thinks that Langadalsfjall is only big enough for one, so he tried to kill Adam in a rock avalanche and throw Meagen off a cliff. Thankfully, Adam and Meagen survived to see another day, but Meagen’s boots didn’t. 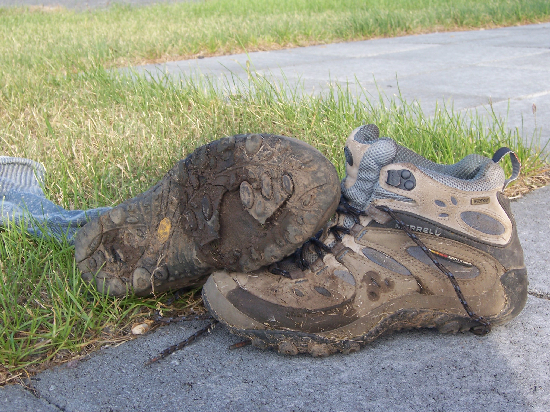 Part of Meagen's boot didn't make it back to base camp today. TALLINN, ESTONIA–Scientific museums preserve specimens and information from generations of researchers, collectors and students. The interiors of a typical paleontological museum contains windowless rooms filled almost to the ceiling with cabinets, each with dozens of drawers containing carefully labeled and cataloged specimens. Because information grows rapidly in science, the most important information on those labels is not the identity of the fossils but where they were found. The names and even systematic categories often change over the years as we learn new characteristics of particular groups, but the location information will always be critical for the value of the specimen for future researchers. Today we visited the Institute of Geology at the Tallinn University of Technology. We were hosted by Dr. Helje Pärnaste, a paleontologist who specializes in Ordovician trilobites. She generously spent the day with us going through the collections. Using one of the best electronic cataloging systems we have ever seen, she was able to take us to drawers containing specimens from our study localities. We were able to add to our faunal lists and see better preserved fossils which will help in our future identifications. We concentrated on crinoids, of course, and were able to calibrate what we found which was truly new and see many other examples. The Estonia Geology Research crew examining specimens in the Institute of Geology collections (left); a typical museum drawer (right). Much of our work involves finding specimens from our study locations and making quick and simple photographs for later reference. Again another scientific colleague we did not know before this trip helped us immensely and has become a friend. It is a remarkable universal fellowship. I hope we are able to return many such favors back in the United States.